As a leading manufacturer of safety eyewear, Pyramex is clearly focused towards on-going Research & Development. Through systematic and comprehensive precision testing, we can successfully turn concepts and technical innovations into first class products. The Pyramex product range have long been recognised as a market leader when it comes to protection, Style, Comfort and Innovation. Before we introduce a new product, we listen to our clients and their customers. The I-Force design is based on feedback from users who work in some of the harshest conditions in the world, was introduced as a solution to intense fogging issues. From its H2X anti-fog coating, to its dual lens technology and sleek stylish look, the I-Force has taken sealed eyewear to the next level. By closely listening to the needs of our distributors and end users, Pyramex has once again introduced an innovative, solution-based product that will lead the industry for years to come. 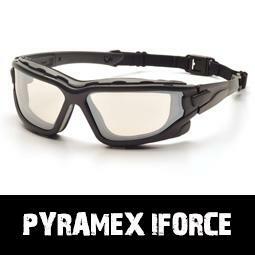 The sporty, lightweight frame design of the I-Force is far from the bulky weight of a goggle. A dual pane lens provides the ultimate anti-fog performance by isolating the temperature difference inside & outside of this eyewear. The thermal system provides anti-fog protection in the worst weather conditions or extreme-temperature working environments. Pyramex went one step further and coated the outside of the lens with H2X anti-fog coating for even more resistance to fogging, due to extreme temperatures. I-Force has an indirect vented foam carriage which provides maximum dust protection, as well as a sufficient airflow outlet for heat. Interchangeable temples and an elastic strap are included with each pair of I-Force. - A double lens goggle is different than a single lens goggle because it actually uses two lenses in one. - An outer polycarbonate lens protects against the environment, while an inner lens is designed to prevent fogging. The inner lens is made from acetate, separated by a thin spacer of air, and sealed together with foam. The air barrier that exists in a double lens goggle is what makes them far superior to a single lens goggle. The primary reasons for this supremacy are because first, the air spacer creates a thermal barrier between you and the cold or hot air. This creates a goggle that is much more comfortable to wear. Second, the air barrier helps to further prevent fogging by equalizing temperature between the heat of your face and the outside air of the climate. The Pyramex range of protective eyewear by Elliotts is comprehensive. From the economical Integra and Intruder to the fashionable Goliath and Protocol, Pyramex has something to meet your needs. Based on the feedback of millions of users, Pyramex offers a full range of products that focus on Safety, Comfort, Style and Innovation.